Three of the five largest church buildings in South America are found in Brazil. The Basilica of the National Shrine of Our Lady of Aparecida in Brazil. Among the 15 most massive church buildings in the Americas, five of them have their locations in the United States. These churches in the US include Cathedral of Our Lady of the Angels (6038 m2), Basilica of the National Shrine of the Immaculate Conception (7097 m2), and Washington National Cathedral (7712 m2). On the other hand, there are three large churches in Canada, three large churches in Brazil, and two large churches in Mexico. Included in the 15 large churches in the Americas are one church from Columbia and one church from Argentina. The names of the churches are Primate Cathedral of Bogotá (5300 m2) and Cathedral of La Plata (6968 m2) respectively.The four largest churches in South Americas are Basilica of the National Shrine of Our Lady of Aparecida in Brazil, Cathedral of Saint John the Divine in the United States, Basilica of Our Lady of Guadalupe in Mexico, and Rio de Janeiro Cathedral in Brazil. The largest church in the Americas is the Basilica of the National Shrine of Our Lady of Aparecida. It is 12,000 square meters large and located near Sao Palo in Brazil. Popularly known as Our Lady of Aparecida, this church was named after the patron saint of Brazil called Aparecida. It was consecrated for use on July 4, 1980. The church can hold a total of 45,000 worshipers. Every year, Our Lady of Aparecida church celebrates a feast in honor of the Virgin Mary. The feast, which takes place every October 12, attracts over one million people. 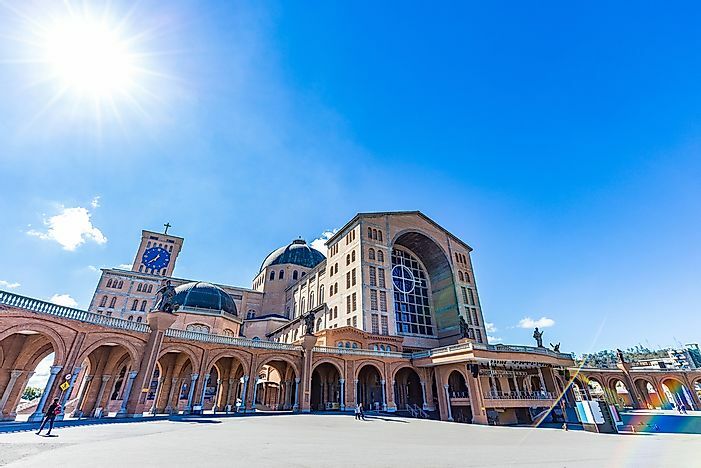 The Basilica of the National Shrine of Our Lady of Aparecida is the 2nd largest church in the world. The Cathedral of Saint John the Divine is the second largest church in the Americas. By land area, the church covers 11,200 square meters of land. It is located along Amsterdam Avenue in New York City, US. It is famous for being the 5th largest church in the world. The Cathedral of Saint John the Divine lived through the World Wars I and II. The church’s original design was the Byzantine Revival-Romanesque Revival style. However, today it also has the Gothic Revival style. The principal patron associated with the cathedral is John the Evangelist. The nave of the church has a seating capacity of 6,000 worshipers. The third largest church in America’s is Mexico’s Basilica of Our Lady of Guadalupe. The church is 8,167 square meters large. The church was consecrated for use on October 12, 1976. It can hold 10,000 worshipers. Also known as Our Lady of Guadalupe, the church contains the famous statue of the Virgin of Guadalupe. The church exists upon an Indian’s claim that they had seen the saint patron Guadalupe in 1531. The architect of the Basilica was Pedro Ramirez Vazquez. Besides being places of worship, these churches are also tourist destinations. The cathedrals attract millions of visitors every year. Hence, people visit these large churches for both religious and non-religious reasons. Those who visit the cathedrals for religious purposes go to the churches to offer their prayers to the saint patrons such as the Virgin Mary, Guadalupe, and Saint John. On the other hand, tourists visit these large churches due to their rich history and their unique architectural designs.